Ignore the duck confit and focus on the squash, people! 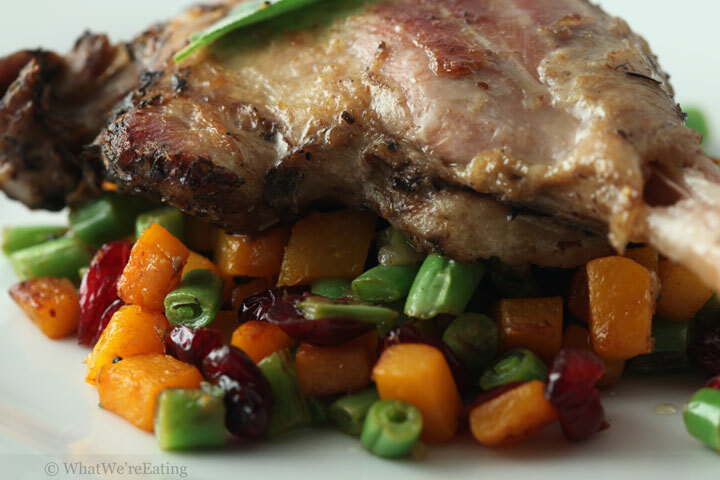 We’re eating crisped duck confit on a bed of caramelized butternut squash, green beans and dried cranberries sauteed in sage & lemon zest brown butter then deglazed with lemon juice for a little brightness. It’s finally beginning to feel like fall here in San Diego. I’m pretty sure it was in the 50’s this morning when I woke up.. either that or I’m a serious weather wimp (the latter option is definitely plausible). Either way all of this crisp, brisk weather has me in the mood for fall food. In this case, some butternut squash sauteed with brown butter… yeah yeah yeah, sure, there were other parts of the dish but really, it was the butternut squash and brown butter I was craving. The sweetness of the squash made a great match for the tartness of the cranberries while the crispness of the green beans added a nice texture. When we were eating this dish I realized how great of a side dish it would be for a Thanksgiving or Christmas meal in addition to rocking on any given work night. If any of you guys give it a try we’d love to hear what you thought about it and if you liked it as much as we did! Place butter in large saute pan over medium heat. Allow the butter to brown over medium heat, stirring frequently, until it has turned golden and smells nutty, about 6 minutes. Add the butternut squash to the pan. Sprinkle with pinch of nutmeg, kosher salt and freshly cracked black pepper. Toss then allow the butternut squash to cook, untouched, for about 4-5 minutes or until the bottoms begin to caramelize. Toss the squash and cook for another 4-5 minutes so that a new side of has a chance to caramelize. Next, add the green beans, dried cranberries and sage to the pan. Sprinkle with kosher salt and freshly cracked black pepper. Stir. Cook for another 10-15 minutes, stirring occasionally, until the green beans are tender and the squash has cooked through. Finally, add the lemon juice and zest to the pan. Stir and continue cooking until all of the lemon juice has cooked off. Taste then adjust seasonings as desired with more kosher salt and freshly cracked black pepper. Serve immediately. Enjoy! This looks absolutely amazing, and very accessible. Thinking I should make that this weekend, with roast chicken and mashed potatoes along side. Oooh yum. Amber – it’s soooo easy! It would go absolutely perfectly with a roasted chicken too. If you make it I’d love to hear how it turns out. Looks fantastic! But how on earth are we supposed to ignore the duck confit? I mean, really?? Yum yum yum… I adore this idea… but Tyler is not working … ‘cos I still really want – *need* that duck confit too!!! I was doing a recipe search and found this! I am seriously considering making this as part of my Thanksgiving contribution at the big family dinner. I have a squash on my counter, cranberries in the cupboard and frozen green beans from my garden! The colors are enticing and I can already taste the delightful mix of flavors. I will give a follow-up report!